Hans-Jakob Arnoldy was born on 1 June 1916 at Wittlich. Arnoldy was posted to 4./JG 77 in September 1939. He recorded his first victory on 12 April 1940, when he shot down a RAF Hampden twin-engine bomber attacking shipping near Kristiansand. 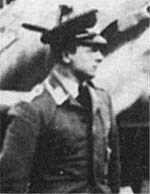 On 26 October, Leutnant Arnoldy was injured in the crash-landing of his Bf 109 E-7 (W.Nr. 6090) “White 5” following damage received in aerial combat near Bergen. Arnoldy was to claim six victories while based in Norway. In April 1941, Arnoldy was operating over Greece. On 14 April 1941, Arnoldy engaged RAF Hurricanes as they were taking off from their airfield at Larissa and shot one down as his seventh and last victory. He was wounded in the chest by fire from Canadian ace Flt Lt John Mackie’s (7 victories) 33 Sqn, RAF Hurricane and baled out. As he floated down over the airfield Greek soldiers fired on him. It is not known whether he was hit again but he died within a short time. His aircraft, Bf 109 E (W.Nr. 5277) “White 5” made an almost perfect belly landing and was virtually undamaged; just two bullet holes below the cockpit hood, in line with the pilot’s chest. Hans-Jakob Arnoldy was credited with seven confirmed and several unconfirmed victories. 14:25 Hudson 4./JG 77 Trondheim Skua?